Dale Cresswell keeps his gun on his hip at all times: in his classroom, at sporting events, whenever he's at school. 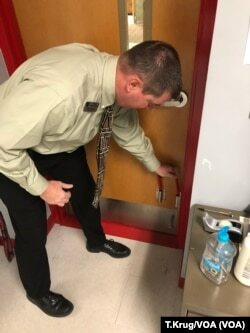 Cresswell, head coach to the senior boys' track and cross-country teams, is one of a small, but growing group of teachers around the United States who are volunteering to carry a weapon. His employer, Heber Springs School District, just came online this semester. "It was a no-brainer. I have a daughter still in school," said Cresswell of his decision, acknowledging that he might know any potential shooter. "I see it as, I'm protecting more than one person. I'm protecting all the other students." In order to qualify, Cresswell and other faculty — including administrators and IT professionals who can move around more easily — underwent background checks and psychological tests. Each receive about 60 hours of training and goes through additional training three times a year. "I know that last summer there was a big movement here. We were fortunate that we had made the decision early, and we were able to secure trainers and get our time slot locked in," said Heber Springs School District Superintendent Alan Stauffacher, noting that some other schools are "struggling" to get set up. A semester in, the novelty of Cresswell carrying a weapon has worn off. He said that when asked, the students tell him they don't even notice his gun anymore. "It was just so terrible. Something like that, it makes you really pause," Hopkins said. "I started getting calls from parents and grandparents asking, ‘What are you doing to protect our kids?'" "It's not like we want to be cowboys, but if you stop and think about the reality of someone coming into your business or your school, don't you want to be prepared?" he asked. Hopkins said the local school board was enthusiastic and he didn't receive any notable pushback at the time. Cathy Koehler, president of the Arkansas Education Association, said that she knew of a few teachers who were uncomfortable with the decision to arm faculty. She noted that it's easier to speak in opposition to this policy in some parts of the state, but not in others. "There's so many issues that educators have to address, so they have to balance, 'Is this the issue where I want to plant my flag?'" she said. 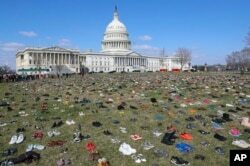 About 7,000 pairs of shoes, one for every child killed by gun violence since the Sandy Hook school shooting, were placed on the Capitol lawn by Avaaz, a U.S.-based civic organization, on Capitol Hill in Washington, March 13, 2018. Protecting schools from future shootings has increasingly occupied administrators and lawmakers' time. Just this year, 113 people were killed or injured in school shootings in the U.S.
Their report, released earlier this month, stressed that individual schools need to make decisions for themselves, but recommended that "no campus should ever be without an armed presence when staff and children are attending class or a major extracurricular activity." Following the Safety Commission report, Moms Demand Action stated that "putting guns in the hands of teachers is not the answer..." and that "research indicates that arming teachers will make children less safe." "As a general rule, I don't think anyone believes that it is preventative. I think that most thoughtful individuals know that if a person sets out to do harm to themselves or someone else, they're not gonna stop and think ‘Oh, there might be someone armed,'" said Cathy Koehler, president of the Arkansas Education Association. Koehler stopped short of saying that faculty shouldn't be armed, recognizing that it can take 20 minutes for police in some rural counties to respond to a situation. She stressed that schools should gain community buy-in, which superintendents in both Clarksville and Heber Springs said they did. "Our preference is always going to be that the investment is made in the mental health services that are so desperately needed and are underfunded," Koehler said. "Just about every time we hear of another shooting, we look at how that took place. How would we have combated that? Could we fix that?" Gauntt asked. Over the years, the school has installed dozens of surveillance cameras and stronger classroom locks. Teachers undergo survival training to apply a tourniquet, for example, in order to prevent kids from bleeding out from bullet wounds. Students as young as those in elementary school are taught to be a "partner in [their] own survival." Instead of hiding quietly under their desks, they are now taught to make loud noises and throw things. 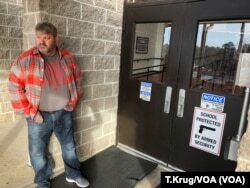 "It's mind boggling that I've gotta go down and tell a kindergartener that if a man comes in and tries to shoot you, that you need to run around and scream," Gauntt said. "That's not why I got into education." When it comes to arming teachers inside the classroom, he's reluctant to take a hard stance but admits that he worries about guns getting loose. "School safety is an illusion," Gauntt said. Are US Mass Shootings the New Normal?